Ingrowns, bumps, irritation—ugh. Getting rid of hair down there is a chore, but you can make it easier on yourself if you stop believing these common misconceptions. The razor bumps. The ingrown hairs. The sensitive skin. The tough angles... There are few places on the body more challenging to maintain than the bikini line, as many women have learned struggling to shave, pluck, wax, and laser their way to smooth skin. Even more unfortunate, there are a ton of myths floating around about hair down there. Marisa Garshick, MD, a dermatologist at Manhattan Dermatology & Cosmetic Surgery, reveals the myths she hears patients repeat the most in her office. Which did you believe? Dr. Garshick says that shaving anywhere on your body will not cause the hair to come back in thicker; diameter will always stay the same over time. “After shaving, the ends of the hairs are simply blunted, as opposed to the natural soft tip, which may cause the hair to seem coarse,” Dr. Garshick explains. 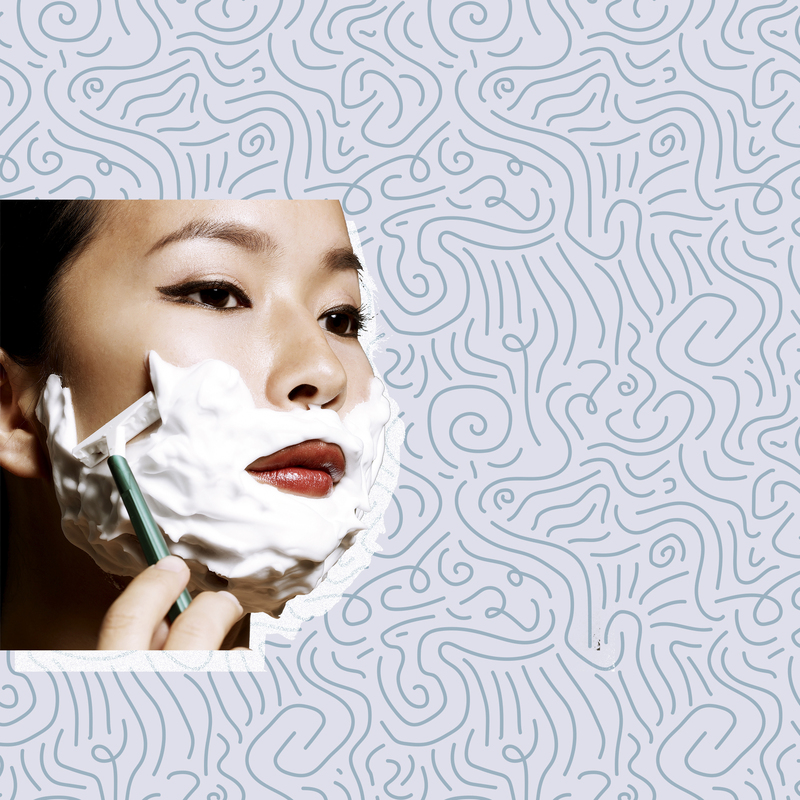 “But the actual thickness remains unchanged.” After shaving, she suggests using a mild cleanser and a gentle moisturizer to keep your skin feeling soft and smooth, even when hairs are growing back. Try CeraVe Hydrating Body Wash ($11; drugstore.com) and Eucerin Original Healing Rich Lotion ($12; drugstore.com). Lots of women think tweezing an ingrown hair is the fastest and most effective way to deal with it, according to Dr. Garshick. They're simply wrong. “Tweezing can lead to trauma of the hair follicle, which will just cause more redness and inflammation,” she explains. “Avoid picking or squeezing as this can lead to scarring.” If you have razor bumps or ingrown hairs, Dr. Garshick says to leave them be. “Often, simply letting the hair grow a little will allow the hair to break free from being trapped in the skin,” she says, at which point you can remove it carefully. You can also use a hot compress to help the point break free. If the ingrown hasn't popped out after a week or two, call your derm, who can extract the ingrown for you. Laser hair removal treatments from a board-certified dermatologist leave you hair-free in five to eight treatments. The key: five to eight treatments, not one or two. The laser specifically targets growing hairs, which is only a portion of your total hairs, Dr. Garshick explains. “Although you will notice a significant improvement after your laser hair removal sessions, you may still notice some hairs that don't go away right away,” she says. “Do not attempt to remove this hair with waxing, because the laser targets the pigment in the hair. If the hair has been removed, the laser can't do its job.” Dr. Garshick says to leave the hair alone. Don’t wax, pluck, or bleach between laser hair treatments, although it’s okay to shave, which will still allow the hair to be zapped by the laser during your next treatment. With many laser hair removal techniques, the laser targets a darker hair against the lighter backdrop of the skin. Dr. Garshick says that dermatologists will advise people with darker skin against those treatment types, because if the laser can’t tell the difference between the skin and the hair, then it can burn the skin. That said, there are now safe and effective lasers for those with deeper complexions. “But make sure to seek a laser hair removal specialist, and ask about a laser specific for darker skin types to decrease the chance of any problems,” Dr. Garshick explains. Though estheticians can perform laser hair removal, it's safest to go to a dermatologist—no matter the color of your skin.